This week, I was honored to see my AutoISP family of boards being put into actual commercial production by Boxtec. Pull the microcontroller from the board, plug it into a programmer, reprogram it, pull it from the programmer, and plug it back into the board. Make the programming pins accessible on the board (e.g. with IC hooks or by adding an ICSP header to the board). This may limit the use to which those pins can be put otherwise (and sparing 4 data pins on an ATtiny85 for programming is rarely an attractive proposition). If the RESET pin on its ICSP header is HIGH (or not connected), all pins on the microcontroller are connected to the development circuit, as if the microcontroller were plugged into the circuit directly. If the RESET pin goes LOW, the MOSI, MISO, RESET, and SCK pins on the microcontroller get disconnected from the development circuit and connected to the ICSP header on the master board instead, which allows the microcontroller to be reprogrammed. This makes it possible to use AutoISP transparently with most ISP programmers (e.g. the ArduinoISP sketch or ScratchMonkey), as long as those programmers leave VCC turned on while not programming. With the exception of the RESET pin, all other pins of the microcontroller are available for unrestricted use. All electronic are placed on the master board, while the slave boards merely have sockets and pin headers. At the moment, slave boards are available for the ATtinyX5 (25/45/85), ATtinyX4 (24/44/84) and ATmegaX8 (88,168,328) series, although the approach is applicable to any ATtiny or ATmega processor. 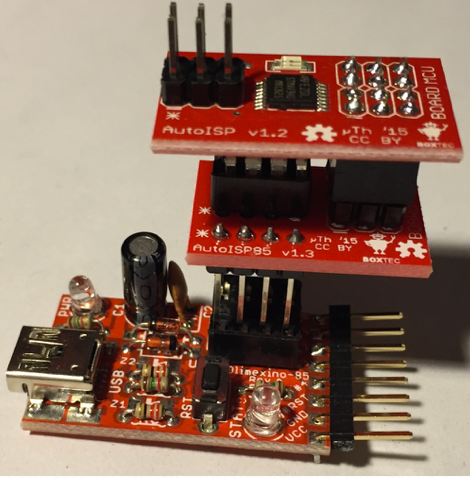 Detailed circuits are available on Github and in the AutoISP manual.